While hanging out between basketball games this afternoon, talk of Singapore hosting the Youth Olympic Games led to the favourite Singaporean pastime of government bashing. Car owners were upset that despite having paid their road tax, they still had to give way to official YOG vehicles or risk a fine. Others were shocked at the incredulous amount of money that went into this (“3x over the budget!”). I must admit, I wasn’t a whole lot enthusiastic about us bidding to host the Youth Olympic Games two years back. It felt like the consolation prize; like eating at the kiddie table. It wasn’t until I saw Selwyn’s photo that the possibility that we might be on the cusp of something special crossed my mind. When I saw how the staff and students in my school came together for the the arrival of the YOG torch at our campus, I became pretty sure that the games would play a part in the building of the nation, especially in the hearts of the younger generation. 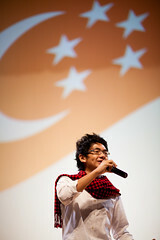 This was most evident when we watched the Singapore Flag raised to a stunning rendition of the Majulah Singapura. I’m actually glad that we’ve chosen to host the YOG instead of the actual Olympic Games. There is so much innocence in youth, and when it comes to children, we are better able to put aside the primal urge to place competition as the sole driving force for the games. Instead, education, cultural exchange and friendship lie at its heart. There is no medal tally for the YOG, though I’m sure enterprising newsmakers will quickly remedy that. The message to the youth athletes so far has been that they should “have fun”. Maybe we won’t see an acceptable ROI on the games. Maybe it’s inconvenienced us. But there are many intangible goods - unquantifiable - that have come out of Singapore hosting the YOG. A sense of national pride on the international stage, a worldwide unity in the nurturing of the next generation, a temporary reprieve from the strict pragmatism that binds our island state. Yes, it’s probably an illusion, but a reprieve nonetheless. I’m not saying that the organising committee shouldn’t be transparent about the over-expenditure. I’m saying that if we had once bemoaned the fact that the government clings on to GDP as its key indicator of how well citizens are being taken care of, maybe we shouldn’t be holding on to ROI so tightly either. I’ve spent a large part of my adult life trying to understand Singapore and Singaporeans. It is ultimately a search for self-identity in the context of the country in which I was born and raised. Why do we do the things we do? Where most countries would be proud of being showcased on an international stage, why do some vocal Singaporeans seemingly want the Youth Olympic Games to be seen as a failure? Why do we sit back and complain, waiting for someone else to solve problems we see rather than take an entrepreneurial approach to problem-solving? I’ve come to an understanding (not conclusive, by any means) that the rhetoric used on us has a large part to play in the way we perceive ourselves. While we look back at history with pride at being able to break away from British colonialism, I fear we still live under the same yoke. We are often told that Singapore has no natural resource except her people. We are called “workers” and the mainstream media constantly bombards us with coverage of political speeches seeking to “increase our productivity”. We are told that the sacrifice of personal freedoms such as public demonstrations are necessary to create a stable environment for foreign investment. All well and good, but why does it always seem like we’re working for someone else? Why are we a resource for others to mine? Why are we always working “faster, cheaper and better” to compete as a source of skilled labour for foreign parties to exploit? Could it be, that having lived under this label all of her 45 years, Singapore has become less human and more commodity to be sold or traded? Where once we stood for incorruptibility (a facade to some, perhaps), we have traded it for the glamour and cold hard cash of mega-casinos. It is all business, and everything is for sale. And the perception is that the politicians are the ones doing the peddling. Shouldn’t we be inspired with loftier dreams? Shouldn’t we talk of entrepreneurship, hiring rather than being hired? Shouldn’t we take the bull by its horns and seize our own destinies? True, the reality is that most will end up as “workers”, but hope is the fuel upon which entrepreneurship feeds. And a spirit of entrepreneurship (I mean for it to be more than just the running of a business) is essential in creating a national identity we can be proud of. Singapore should be a force for good in the world, directed by the strength of our character, and driven by our innovation and hard work. We are much more than lambs to the slaughter, and brains for plunder. 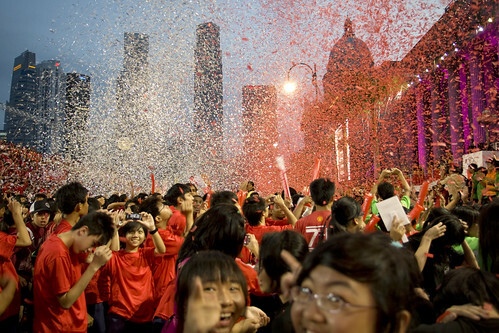 Happy National Day, Singapore, wherever in the world you may reside. Melting pot. You often hear that description used on large cities where people from all over gather, intermingle and merge into a collective stew. There was a time we described Singapore as a melting pot of cultures, and understandably so: we were a migrant population from disperate parts of Asia, all gathered together. But as I grow older, I begin to realise that it isn’t entirely accurate to describe Singapore as a melting pot of cultures. It is much more apt to think of Singapore as a plate of rojak; and I don’t mean it in a bad way. In rojak, we have many different ingredients that retain their original properties, placed together in a bowl, and held together by a mouthwatering sauce. It is in our diversity that we find a beauty so inherently Singaporean. This beauty was on full display this morning at our National Day celebrations held in the Temasek Polytechnic’s Convention Centre. The various items showcased the richness of the different cultures found in Singapore, and together we celebrated with an entire gamut of expression: we danced to our own indigenous dances, Chinese, Malay and Indian and sang in our own languages. Then the programme kicked it up several notches with mashups: Chinese soppy songs with Indian dance, and the highlight of highlights for me was the recitation of the Singapore Pledge in four languages. The pledge was recited in Chinese by a Malay girl, in Tamil by a Chinese girl and in Malay by an Indian girl, and then everyone recited it in English. These girls showed us the equality of race, language and (did anyone else notice) gender. The idea that Singapore stood for a place where we could be who we were and find a sense of amazement, fascination and respect for each others’ culture unfurled before me right there. It was beautiful to behold. We need so much to taste the richness in each others’ culture and realise that we are unique because of the combination, and stronger because we are different. This is my wish for Singapore: that we don’t merely tolerate different cultures, we should celebrate it always.